Five Wire provides 5 unique tools that address different needs of digital designers. Each tool operates independently providing its capabilities in tandem with other tools. For example, you can generate digital stimulus with the Logic Source while capturing test results with the Logic Analyzer. The tools can also interact with each other and the outside world using events or triggers. Each tool provides an event input and an event output. For example, the Logic source can generate an event on a particular output vector. The Logic Analyzer can be configured to receive that event as a trigger input to terminate its acquisition. 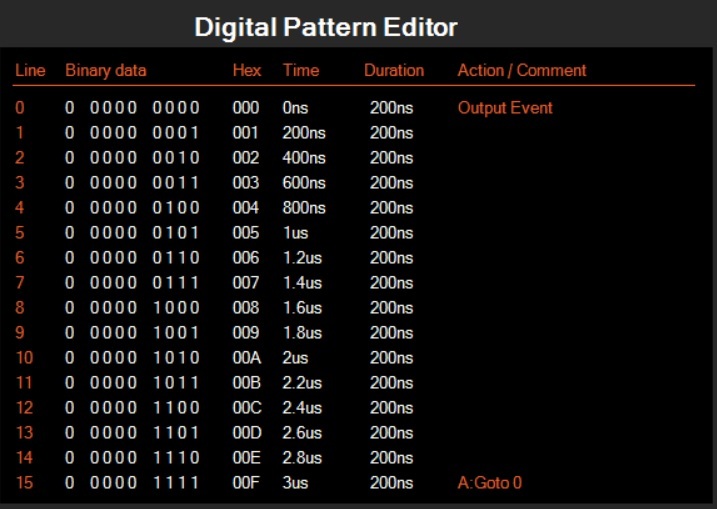 The trigger protocol tool provides trigger inputs and outputs that interface the event system with the outside world such as an oscilloscope. Linking the Five Wire tools using events extends their capabilities. Here we will show a few examples of what you can do with events. The Logic Source tool can both source and accept events. To generate an output event, you specify event to be produced when a selected vector is output. For example, here we show a simple count output pattern where an event is output each time the zero vector is output. This event could be used to trigger the Logic Analyzer tool to capture the current state of the system. 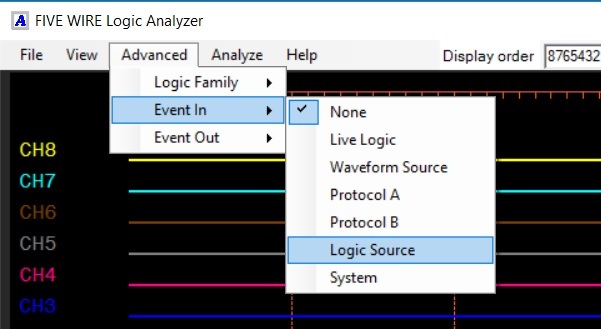 First we must select the Logic Source event as an input to the Logic Analyzer tool. Next we configure the Logic Analyzer trigger to use the input event. The Logic Analyzer will now trigger on the event generated by the Logic Source as shown below. The Logic Source can also receive events. In this example the Logic Source is configured to send its count pattern each time an event is received. We will use the Waveform Source to create an event once each millisecond. We will use the Logic Analyzer to capture the waveform. First we select the On Event mode for the Logic Source keeping the same count pattern as before. We select the Waveform source as the event input. The Waveform Source is configured to generate the default 1 KHz sine wave. It will generate an event each millisecond at the start of each cycle. We then capture the Logic Source output using the Logic Analyzer as shown below. Zooming in we can see the count pattern burst that occurs when the event is received. 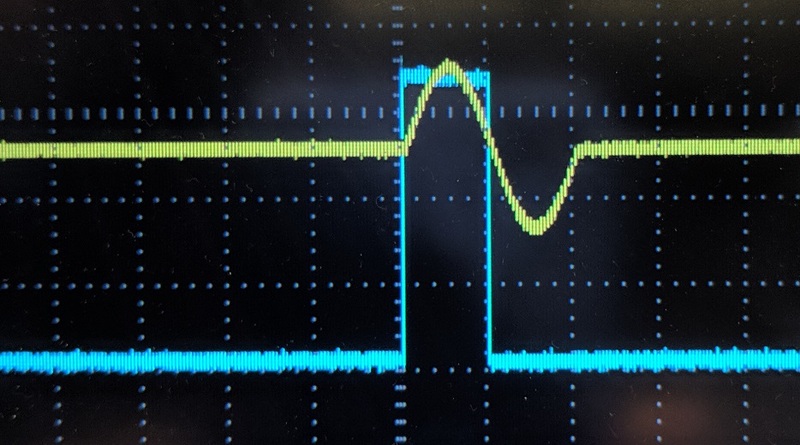 We can reverse the roles making the Logic Source provide an event each millisecond that the Waveform source will use to trigger its sine wave output. 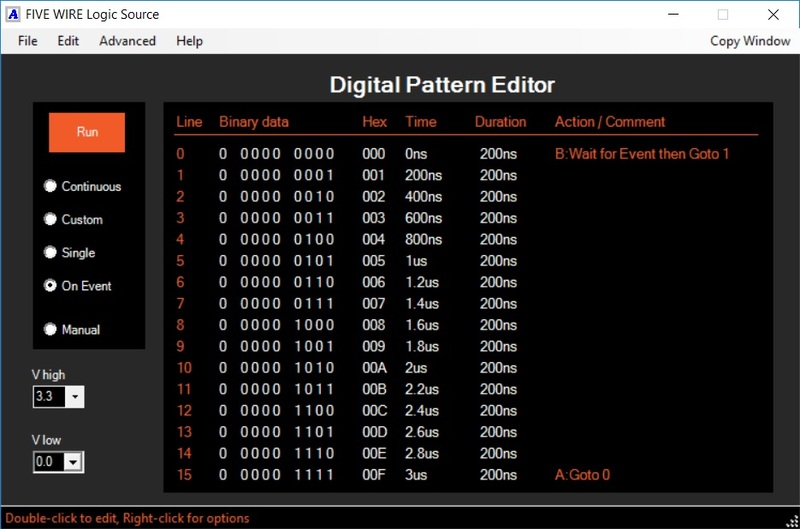 We exported the Logic Source event using the Trigger Protocol probe so we could also capture the event on the scope as shown in screen capture below. Events can also be sourced by the System. Pressing the front panel button labeled System or by clicking the SYSTEM button in the Five Wire System window, an event is generated which can be used by any of the tools. This allows you to generate a waveform on-demand at the press of a button. 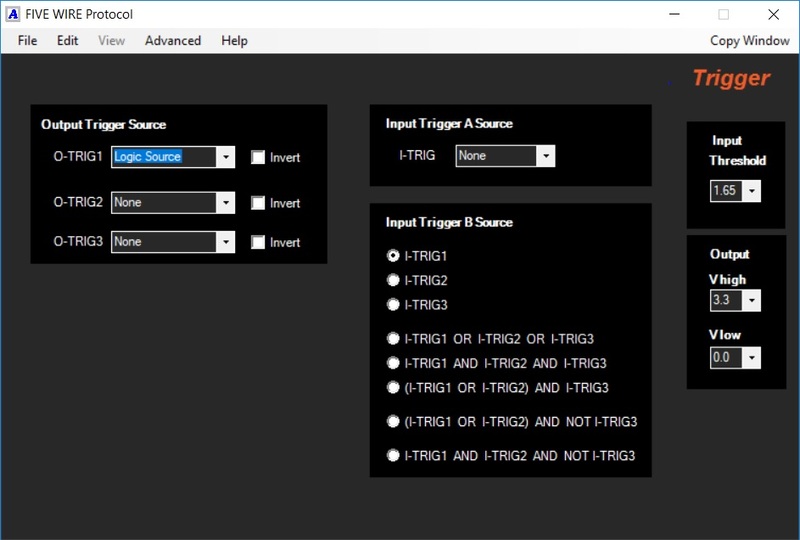 The Trigger Protocol tool allows you to input events from an external source or to output an internal event from its probe. Here is the configuration we used above to export the Logic Source event to the scope. In this case the probe output O-TRIG1 was selected to output the Logic Source event. Up to 3 different events can be output. There are 3 event inputs that can drive up to 2 internal events, Protocol A and B. Protocol A can be sourced from any of the 3 inputs. Protocol B can select any of the inputs or a logical combination of the 3 inputs. Five Wire events give you more control and extend the capabilities of each tool. They leverage the high level of tool integration making it easy to create the test that you need.